Mixed use high street property. Suitable for owner occupancy or investment. Ground floor 67.36 sq mt (725 sq ft) retail / stores / staff room. Basement 77.58 sq mt ( 835 sq ft) retail / stores. Upper parts self contained residential flat. 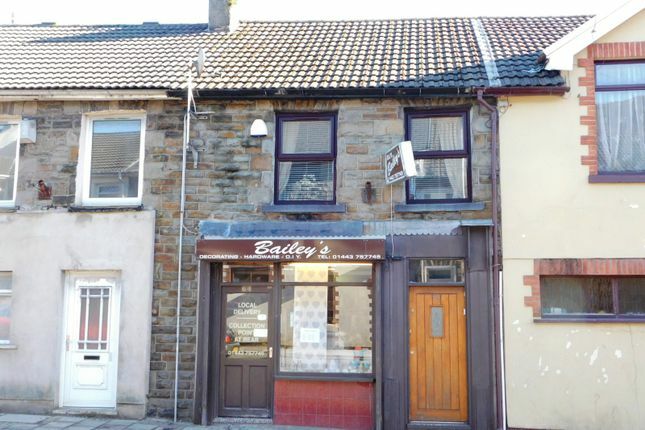 Description, Location & Directions; Barbara Rees Commercial is pleased to offer for sale, this mixed use high street property comprising a retail shop and self contained residential flat. The property is suitable for owner occupancy or for investment, via rental of the separate parts. Duffryn Street is located at the South Eastern end of the high street in Ferndale (A4233) which is represented by a healthy mix of local traders and varied business users with nearby retailers including The Co-Op Greggs and Sheppards Pharmacy. Gross frontage; 3.96m ( 13ft) Display window shop front with public access and a security roller shutter, separate access to the upper parts flat. Ground floor; 67.36 sq mt ( 725 sq ft) retail sales / stores / kitchenette / staff room, acoustic tiled ceiling with diffused lighting, access to the basement. (The ground floor unit is currently vacant). Basement; 77.58 sq mt ( 835 sq ft ) retail sales / stores / ancillary / rear delivery access. User; Believed to fall within use class A1 Retail (1987 planning act use class orders Wales as amended). Rates; R.V = £ 3,765 (2017 rating list). Upper parts; Self contained residential flat with a lounge / diner, kitchen, bathroom and one bedroom. The flat is currently vacant but has previously been let and was producing a monthly rent of £350-00. Guide price; £70,000 (o.n.o) for the freehold interest, (the property will be sold with the benefit of any tenancies and the income produced, or, alternatively and if required, with vacant possession). General notes; Any information contained herein should be verified by prospective purchasers or their advisors prior to any formal commitment to purchase. The proceeds of crime act 2002 & anti money laundering rules 2007 require us to obtain both personal and residence identification from all purchasers / ingoing tenants where an offer has been made and accepted. Please arrange for the appropriate identification to be provided, when asked. Barbara Rees is advised that the property has the benefit of all mains services and a system of gas fired central heating (not tested). The adequacy and condition of any and all equipment / fixtures and fittings / inventory items, should be confirmed by the prospective purchaser / tenant or via the acting solicitors.